This year’s Statistical Report from the Equality Challenge Unit has just been published, and provides a wealth of detail on students and staff in the academic year 2013-14. A main pat of my work has been looking at student attainment, and others in the University are working on addressing the attainment gap between white students, and those from BAME backgrounds. “the ethnicity degree attainment gap in the UK was 15.2 percentage points. 75.6% of white qualifiers received a first/2:1 compared with 60.4% of BME qualifiers”. The attainment gap exists for all groups, but has closed the most for Asian students. We can now benchmark our own degree outcomes for 2013-14 against this data, and also our 2014-15 outcomes to see how we are progressing compared with the sector overall. Considering students with a disability, then the attainment gap is nowhere near as pronounced as it with with students from a BME background. Finally the report considers the impact of gender, and shows that female students were more likely than male students to gain a 1st or 2(i) and this was the case in all subject areas except social studies. The report goes on to look at the intersections between the main groupings of data. One factor that is not considered is Widening Participation status. Although this is not a factor that is considered from an equality perspective, it is one that is raised as a possible factor whenever we talk about the attainment gap for BME students. Ideally we need to be able to build models that allow us to visualise the outcomes of students, and to easily filter based on multiple characteristics. I’ve been doign abit of work on this very thing this week, and using some old data have built Excel models that allow a visualisation of degree outcomes for combinations of ethnicity, WP status, disability and subject. It’s a great way of getting an insight into how different groups perform in different subject areas. Overall however, as a sector we still have a huge challenge to face in tackling the BME attainment gap. I’ve been writing about it for a number of years on this blog. I really look forward to the day I don’t need to write about this subject. Over on the Equality Challenge Unit blog, Janet Beer (VC of Liverpool and Chair of the ECU Board) writes of the need for consideration of race equality in HE. …..speculating about how long it will be before minority ethnic women, or minority ethnic individuals generally, are fairly represented within our sector is different. Leaders in our higher education institutions know that racial inequalities exist, but we are not talking about them publicly. None of us wants to attract negative press, or say the wrong thing, or to be accused of being institutionally racist. Furthermore, whilst men and women are working side by side to promote gender equality, the equivalent does not seem to be happening to the same extent with race. The combined effort of men and women, with all acknowledging the need for change, has been crucial to the advancement of gender equality. For a step change in race equality to take place, the imbalance in advantage also needs to be acknowledged and owned by all. in a survey of 1201 academics working in the UK and overseas, BME academics are significantly more likely to consider moving overseas in the hopes of furthering their careers than white academics.The research aims to highlight the differences between ethnicities when considering a move overseas and understand why these differences occur as well as establish what higher education institutions can do to retain staff or entice them back to the UK once they have left. The interesting linkage for me in both the lack of a diverse demographic of senior staff as well as a tendency to seek advancement overseas, is the impact that this might have on our students. At our own Learning and Teaching conference in 2014 Winston Morgan clearly showed the importance of having a teaching body that provides some reflection of the student body as part of of tackling the attainment gap of undergraduate students. By having a more diverse staff profile at all levels and in all roles of the organisation might mean that all students can see more clearly that university is for people like them. Last week, the Equality Challenge Unit published its annual statistical report which considers a range of data sets from HESA, relating to both staff and students. This provides a great insight into the diversity of all the people engaged in the UK higher education sector, but also provides data against which we can benchmark ourselves for activities such as Athena Swan or Race Equality Charter Mark. -The ethnicity degree attainment gap has decreased from a peak of 18.8% in 2005/06 to 16.1% in 2012/13, and is at its lowest since 2003/04. Nevertheless, the gap in attainment compared with UK-domiciled white first degree qualifiers remains considerable, particularly for UK-domiciled black: African first degree qualifiers (with a gap of 26.8%) and UK domiciled black: Caribbean first degree qualifiers (24.5%). -The ethnicity degree attainment gap was larger among UK domiciled first degree qualifiers who studied non-SET subjects than among those who studied SET subjects. 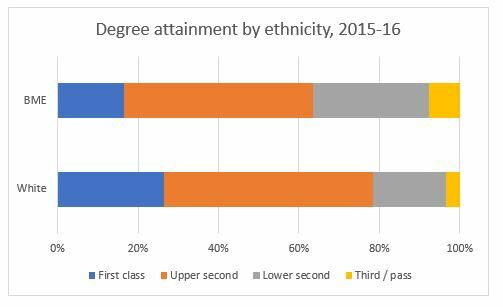 -In every subject, a higher proportion of UK-domiciled white first degree qualifiers received a first/2:1 than UK-domiciled BME first degree qualifiers. So there is still considerable work to be done, firstly to really understand the causes of the attainment gap, but much more importantly, to put interventions into place that will help to remove it. Some of the ideas at our Learning Teaching conference in the summer from Dr Winston Morgan of UEL are worth revisiting. Any university that is trying to reduce the attainment gap has to be mindful of the classification of “BME”. This aggregation is not always helpful, and students from different ethnicity may have a range of different expectations and backgrounds that may affect their engagement and success. More useful is for an individual department in a university to gain a clear understanding of its own student body, their educational backgrounds etc, and then to review past performances on a more granular level, so that all involved in recruitment and teaching have a clearer idea of what the student population actually comprises. When students with disabilities were considered, then in 2012-13 the percentage of students with declared disabilities gaining a first or 2(i) rose from the previous year. These two sets of data reflect what we have seen previously at Staffordshire University – a small (and sometimes insignificant) attainment gap for students with disability,but a significant attainment gap between white and BME students. All in all, the statistics from ECU provide some really useful background information for universities as they progress their equality and diversity agenda. A new publication out this week, from the Equality Challenge Unit is “The rationale for equality and diversity: How vice-chancellors and principals are leading change”. As someone who has blogged in the past on BME student success issues, and has done a small amount of work in my own institution on this, I though it would be useful to see how leadership might influence how universities are tackling the various diversity and equality agenda. It is perhaps telling that that respondents considered that creating an inclusive environment for students was the most important, and seeking external recognition was the least important. Certainly my own passionate belief that in this institution we need to work more to understand why students with a BME background do not achieve in the same way as their white counterparts is driven by my own views of social justice and family history. Even this week I have been shocked by comments about how or why different groups perform and how important or unimportant this might be as an issue. A number of universities had revisited their teaching and learning strategies, to ensure that they were inclusive, and had seen benefits that were experienced by all students. When Winston Morgan spoke to our Learning and Teaching Conference earlier this year, he highlighted that many of the action we may take to reduce the attainment gap between white and BME students will often improve the quality of education for all, and actually maintain the gap. The recommendations from the report are primarily for VCs and leaders – how to use personal leadership, how to involve governing bodies and how to hold leaders to account against progress, recommending the need to “walk the talk”. Wolverhampton University: a student-related objective is to increase the proportion of BME students awarded 2:1 degrees. Attainment champions have been appointed in a number of schools. There are also objectives to close employability gaps for BME and disabled students. up an employability advisory panel and developing strong relationships with major employers. undertaken in-house research into BME student attainment in order to drive the work on enhancing the student experience. In conclusion – a useful addition to the canon of material on how to tackle equality and diversity issues, with a strong message that leadership can make a significant difference. In terms of BME student attainment, then linking the importance of leadership and the need for data driven approaches, to the very clear recommendations from the research of Winston Morgan (around entry tariffs, assessment types, how well the academic staff and leadership reflect the demographic of the student population etc) would mean that a university would be able to identify the steps it needs to take to work towards reducing the attainment gap. HEFCE have just released data on characteristics of staff employed at UK HEIs, with a nifty little interactive tool to allow you to plot the graphs. Sadly it doesn’t;t allow you to add multiple categories together or anything truly interactive,but there are some inetrestign (and in some case, I guess, inevitable) results. If we look at gender, then the more senior you are, and the higher up the pay scale, the more likely you are to be male. this applies in senior leadership roles, but also in academic roles. If we look at ethnicity, then the higher up the greasy pole, the more likely you are to be white. For those universities who are working toward the Equality Challenge Unit Race Equality Charter Mark, or indeed initiatives such as Athena Swan, then it might be interesting to consider recruitment and development policies and institutional results against the national trend, otherwise as a sector we are likely to reinforce the image of senior roles being for middle aged white guys (disclaimer – I am one). To really get a better reflection, then an individual institution could compare its gender and ethnicity profile against both the general population and also against its local and student population. Certainly from a point of view of BME student attainment, there is often a significant difference in the diversity mix of the staff who lead and teach in universities and the student body. For another view on these results, have a look at the registrarism blog by Paul Greatrix. This year’s University L&T conference, run as part of StaffFest2014 had as its theme Student success: raising attainment. Attendance was better than it has been in previous years, which was good news, but more of this later. An introduction and welcome by the VC, Prof Michael Gunn, was followed by an introduction by me, where I looked at our league table position, emphasising the importance of student attainment. Using the strapline “we can be better than this”, I also introduced some of the data around attainment of BME students, before summarising the outline for the day and introducing our speakers. Liz also introduced data on differential attainment based on gender, ethnicity and disability, as well as looking at the impact of students from the different quintiles of the Polar3 classification. Liz emphasised the importance of engaging all staff, not just academic, and said that the partnerships between staff and students were a key strategic enabler. Focussing in now on a specific issue, Winston took us through ideas on how to solve the attainment gap between BMR (or BAME) students and white students. If qualifications on entry are the driver of the attainment gap, then the institution must change either the admissions policy or change the L&T practices to suit the admissions policy. For example, on admission policy, students must be selected by specific subjects and grades, not just UCAS points When admitting students form BTEC backgrounds, then the entry tariff must be raised by 20-30% to allow for their previous learning styles. An increase of 30-40% should be considered for the tariff from access courses. If the admissions policy can’t be changed, then Winston proposed changing the L&T practices to sit the admissions, by adopting the practices of BTEC and Access programmes, ie, fewer exams, multiple assessments, lower SSRs. Finally, provide the skills so that students can cope with the challenges and assessments of university. This was a challenging talk, and even though Winston spoke for longer than intended, I wasn’t going to ask him to stop! Over the next few days I heard so many positive comments about what a great talk it was. How much do we know about the issue at Staffordshire? How could we change our admissions policy? How could we change our L&T practices? How could we address the issue of racial identity, and do we have role models in senior posts? The final keynote speaker was Paul Mangnall, Principal of Stoke on Trent 6th Form College. Paul provided a quick run through the processes used in schools (and in FE) maintain and ensure consistency. Paul ran through the processes of teaching observations, noting that one observation a year led to a “cup final” scenario, with possible over preparation, unrepresentative performances, and increased pressure to perform. Instead, the process now involved observing a member of staff twice over a three day window. The interesting thing about Pauls’ talk was that he described the same kind of observation processes that are used already in other universities. There is clearly scope for us to learn from other sectors and institutions. In conclusion, I was really pleased with the conference and the way in whuch so many people really engaged with the important theme of improving student attainment. The only question I have is this: since we are a teaching-led organisation, then why weren’t all of our academic staff in attendance? It was particularly interesting to see who went to the leadership event three days later instead. For future years we’ll be working hard to make this event much harder to avoid – with topics that are important for everyone who teaches or who supports teaching, then this shouldn’t be difficult. Well also work more closely with our faculties to engage them earlier in the planning process.